Welcome to Toronto Fishing... Toronto Fishing is a paradise for the fishing enthusiast or just the enthusiastic beginner. Ward's Island, one of the oldest neighbourhoods in Toronto, began as a Toronto fishing community in the 1830s. Since then people have been fishing in Toronto for bass, carp, pike, trout & salmon. Toronto Fishing offers an exciting day out on a fishing charter or just enjoy the day in one of the many areas with great fishing in Toronto. You don�t have to go far from home to partake in Toronto Fishing. The Toronto Islands offer a great variety of sport fishing. Toronto Fishing has several great locations for carp, bass & pike. The canals at Hanlan's Point are probably your best bet for Toronto fishing. Take the ferry over to Hanlan's, walk a hundred yards or so & start Toronto fishing. When Toronto fishing for pike keep in mind that most of the canals will have pike cruising around, or try the lagoons around Ward�s Island. Try to get over there before the fish spawn & again after they are done for the best Toronto fishing. You'll find good pike Toronto fishing usually during the first two weeks in April. Warm sunny days with a slight breeze are best for Toronto fishing because this warms the water & stimulates the pike to move and look for spawning areas. Toronto fishing for bass & various panfish is best in the weed beds. There is great Toronto fishing right at the Toronto Waterfront. You�ll find great Toronto fishing at the marina at the foot of the Spadina Ave. When Toronto fishing here you will find lots of fair size pike. Toronto fishing all along the downtown waterfront will provide you with big carp because they stay pretty close to the harbour walls. Ask the experts at Toronto Fishing for advice on the best bait to use. Bluffers Park is a fabulous spot for fishing in Toronto. Toronto fishing in the spring at Bluffers Park is where you can catch brown trout & lake trout from casting from the rocks. Later in the spring, & through summer & fall, the best Toronto fishing is offshore from a boat when you can catch chinook & coho salmon, & steelhead. This is a popular Toronto fishing spot for brown trout in the fall. The Too Good Pond is a Toronto Fishing hot spot for largemouth bass, rock bass, pumpkinseed sunfish & white suckers. When fishing in Toronto try Frenchmans Bay. You'll find good Toronto fishing for pike & carp here. You can fish from the shore or put in a boat in the inland pool. This is a great spot for Toronto fishing all winter long. 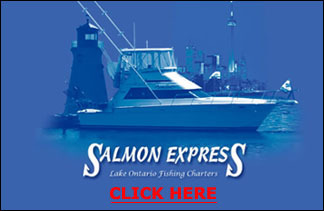 Toronto Fishing offers great corporate & pleasure cruises. All Toronto Fishing boats are fully equipped both for safety & for fishing. Toronto Fishing provides you with everything that you need for a great day out. The only thing you need to bring for a day of Toronto Fishing is yourself, your customers, fishing buddies or bring the whole family. Call Toronto Fishing now for a great day of fun & sport!